F1 Fanatic has an article today looking at a new circuit in Argentina - Potrero de los Funes. It is a fabulous track, winding its way around a lake and climbing up and down hills, and the comments are coming in thick and fast. Unsurprisingly, they all love the circuit and want F1 to stage a race there. We all know it will never happen, of course. Even though Potrero has already been used for a round of the FIA GT Championship, it would be dismissed as too dangerous for F1 cars and one cannot see there being enough funding for Argentina to buy a race anyway. Gone are the days when new circuits could be interesting enough to hold our attention - we have to run races at night to inject a little excitement. In fact, with the regulations heading down the spec formula route, nothing but bland and sterile new circuits on the agenda, serious problems on the financial side and the sport being turned into a rather sleazy money-making concern, it is likely that the gradual drift of the real fans away from F1 will continue and increase. Some of the political shenanigans of recent years have almost succeeded in turning me away as well and, like many, I have pondered upon what substitutes are available. Many turn to Le Mans and GT cars and such series do have happy memories for me, I must admit. I watched in the sixties, when the battles were between Ferrari, Aston Martin (gorgeously ugly brutes) and a lone birdcage Maserati that invariably led for a few hours before exploding. 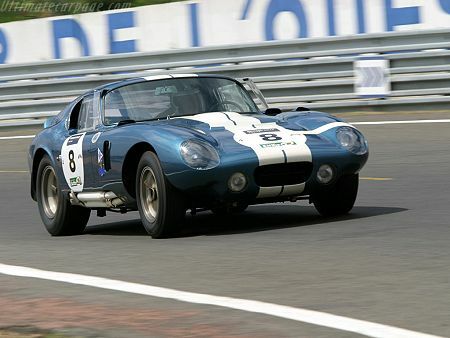 Then came the Ford GT40s and Cobras, followed later by the all-conquering Porsches. And it was in the early seventies that I lost interest, with the races generally dominated by one marque and little but pure speed to recommend them. That is what puts me off GT cars, there being insufficient variety and potential winners. Similar stories could be told of the various road car series around, the BTCC, DTM and even NASCAR. Somehow they do not offer the cutting edge technology and finely-honed skills of the drivers that is still F1. As an old fogey, I am bound to wish that things could be put back twenty or thirty years and the regulations and politics reduced to a dull roar in the background. There are series in which old F1 cars are pitted against each other, the historic races that deserve much greater popularity. But they are hardly substitutes for the real thing; the drivers must always hold back a little, aware that their cars cannot be replaced, and it is impossible to ignore our knowledge that the peak of technology has moved on. So we are stuck with the F1 that Max and Bernie choose to present to us and we will never see the most advanced open wheel cars on the Potrero circuit. It is depressing to think that only the lesser formulae are likely to sample its delights. Unless some drastic changes happen within F1, of course. Were there to be a revolt by the teams and a rival series set up, circuits like Potrero would suddenly become viable for the sport. If a more realistic view were taken of the financial dealings of F1, if the circuits were no longer required to follow a standard formula, if the regulations were freed from the restraints currently in the making, there is no reason why there should not be a GP in Argentina again. Or several in the States. There is the problem in a nutshell; it is not the racing that is turning the fans away - the last two seasons have been the most exciting and hard-fought for years. What is stealing our enjoyment is the way the sport is run and the awful decisions made by those in power. I experience only despair when I look at the future proposed by Max and Bernie, hence my pondering on other series and alternative routes for F1. The sport has to change and find a way to continue in the world of tomorrow - that is clear. But the changes suggested seem to me to be creating something that is not F1, that is rather a test bed for manufacturers of road cars in which all racing innovation is stifled. And, in that world, there is no room for circuits like Potrero. While I totally agree with your many rants against B. Ecclestone and Max, I fear that if the F1 teams took control of the sport we'd end up in the same dustbin as CART did when they took control. Much better to form a group made up of equal parts of teams, tracks, mfgs & promoters to oversee the sport. You're right, though, it's a shame to not have F1 events at some of the more interesting tracks such as Portero. Glad you liked the article. Unfortunately in its original form I had spelled the name of the track wrong which I seem to have passed on to you: it's Potrero de los Funes (not 'Portero'). Sorry! But certainly, it would be best if all interested parties could be represented, if they ever could be induced to work together. Keith: Thanks - I will edit accordingly. It is interesting that I googled "Portero de los Funes" and had plenty of returns, including an aerial photo of the circuit. I must not have noticed that the spelling was different so I am as guilty as you! I think the best thing that could happen to F1 would be a boycott. Just long enough to financial ruin those who are now running things. As much as we can't uninvent nuclear weapons or land mines we cannot make technology go away because it is inconvenient. If we want to see unbridled technology the engine size must be limited to a greater extent, and perhaps rules on undeflected frontal area or something else to distort airflow might be imposed. Formula Atlantic or the SCCA run offs both provide far better racing than F1 does these days. I agree, Nick. A boycott would hurt us as well (no GPs to watch) but, if it brought about a re-organization of the sport, it would be worth it. Unfortunately, I can't see the teams agreeing to be united in anything like that. Did you miss IMSA? At various times we had Porsche vs Jag vs Nissan vs Toyota vs Ford with the odd One-off thrown in. The racing was often intense and the sight of the Eagle-Toyota blasting around turns 3-4 at Phoenix raised the hair on the back of my neck quite nicely. Though the tech is rather crude, Rolex Grand-Am has some great racing. Rules limit front downforce to about 75-100 pounds. That effectively limits rear downforce, and all the cars have lots of frontal area. Crude, but they pass each other often, and most seasons have featured many different winners. I love the tech of F1, but it's being more and more restricted so real door to door road racing is lots of fun even if the cars are low-tech. You're quite right, Lonny - I missed IMSA. I have followed F1 since I was a young teenager and it is hard to turn away to other forms of racing. At times, I have kept an eye on other series in addition to F1, GTs in the 60s, F3 in the 80s and the BTCC when I get the chance, but F1 remains the priority. So I probably miss a lot of good alternatives but it will take an catastrophe to put me off F1 for good. And, with Max and Bernie doing their best to ruin the sport, it looks as though that day may be coming, however.